Riding the Monorail from the Magic Kingdom, you get a tour of Epcot’s Future World attractions and gives you a different prospective then when shooting from ground level. The Monorail’s windows acted like a polarizing filter to give the sky and clouds a brush-like appearance behind Spaceship Earth. Inside Spaceship Earth is a newly refurbished and updated ride which takes you back to the dawn of Man and into the future as it edu-tains you about communication. 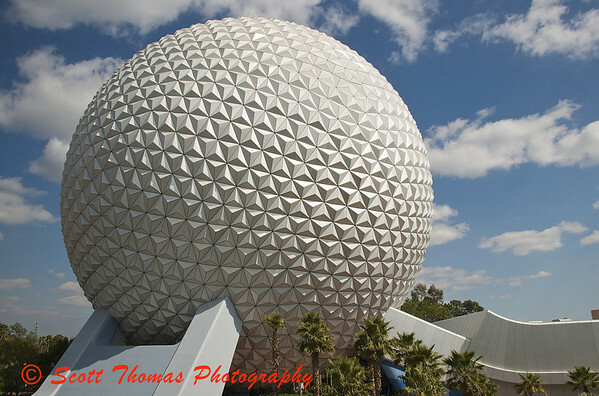 This entry was posted in Travel and tagged clouds, epcot, florida, monorail, orlando, Photography, sky, spaceship earth, walt disney world. Bookmark the permalink. This is a really nice shot Scott – and taken from the monorail, wow! I had to be careful of the new graphics they’ve put on the monorail’s windows but most came out great. Must have caught a good sun angle through the windows. Very good blog! To me very pleased!